Use this Golden Barrel 96 oz. (6 lb.) coconut oil in place of butter, shortening, or other cooking oils for a variety of cooking and baking applications! Coconut oil continues to be on the rise for its versatility and excellent performance, and you can use it for many menu items, from traditional to trendy. With its high smoke point of 400 degrees Fahrenheit, it's a great choice for frying. Use it for freshly-popped popcorn at your concession stand, or use it to help make dairy free or gluten free baked goods at your restaurant or bakery! 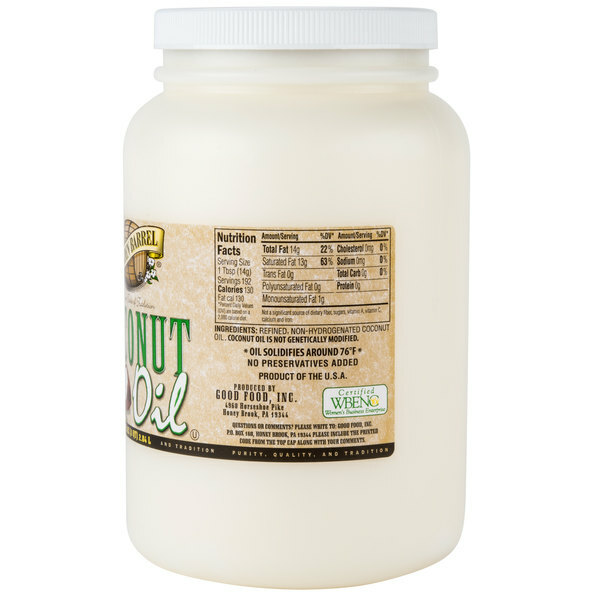 This coconut oil features no added preservatives and has a solid consistency when stored below 76 degrees Fahrenheit. Stock up on this bulk 96 oz. 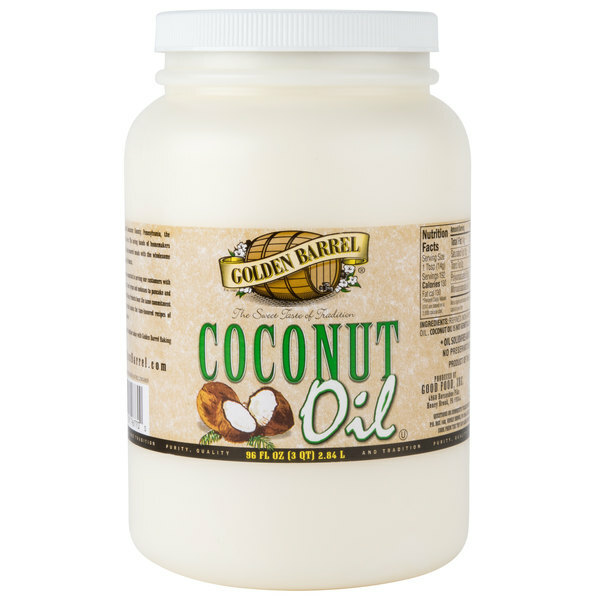 container and discover the many uses of this Golden Barrel coconut oil! 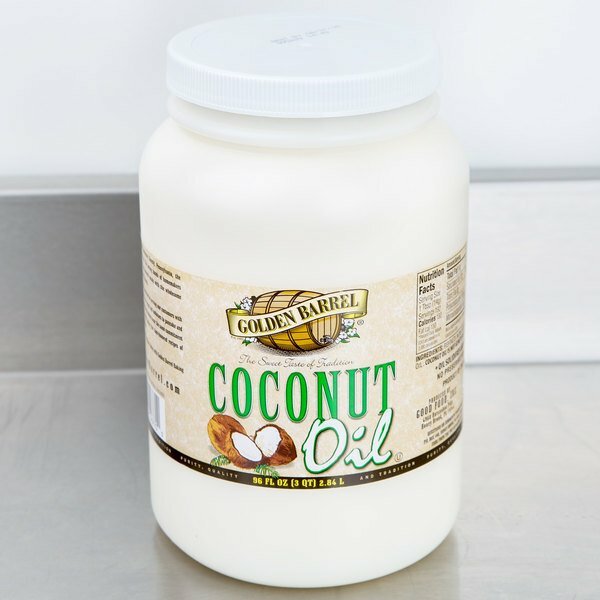 I love this coconut oil, I use it for all my cooking and the price is so economical I can afford to use it for all our deep frying too, because it is much healthier. This is a great deal for coconut oil. I was paying about the same price for only 32 ounces. this is a great oil and just as good as the more expensive one i was using. This product is such a great value and the quality is the same, if not better, than the big chain stores. This particular size lasts a long time. I use it for frying, baking and even for certain beauty needs! I'm super duper happy with this coconut oil! I had never heard of the brand so i wasn't sure of the quality, but it tastes great and last forever! Wonderful price and I would definitely recommend. This is excellent coconut oil and at any excellent price. I used this for the first time tonight, and it far exceeded my expectations, I'll be using this daily. On time shipment, great product and would order again if I didn't already start ordering the 5 gallon size. Best price I've found for coconut oil, online or in stores, even including shipping. This coconut oil is fantastic, and the best price that I have found. It adds a perfect flavor to Indian dishes especially that is to die for. This coconut oil is nice and smooth in consistency, great value! And has a good flavor. Very nice. We use it in our bulletproof coffee daily and in a lot of our cooking and this 6lb jug goes a long way and for this price I feel like we dont have to use it sparingly. This is bigger than the size we were buying at another store, and even with shipping the price was cheaper. It's a good coconut oil we enjoy using to fry our doughnuts in. Excellent coconut oil for all of our baking needs. Melts well blends great and adds the flavor we need for our specialty baking. Great flavor is added. I took one star off of the coconut oil because it dried out. I have always stored my coconut oil the same, but it seems to be all dried out before I was able to use it all, and now I wasted about 1/3 of it. It was a very great product before it dried up, though, and made some great soaps, lotions, and lip balms. This is a great product that's flexible! The coconut oil was very useful in baking desserts and vegan/vegetarian cooking. I was impressed by the flavor and texture. A whole lot of coconut oil and for a great price! Coconut oil is great to cook with (this refined coconut oil has a high smoke point) and delicious raw (on toast) and even in your coffee! Highly recommend! I thought it was delicious for multiple kitchen uses! It's good for mixing with essential oils as well. Great price! I Will be buying it again! I love this Coconut Oil. It works great when cooking and baking. If baking I recommend using less than normal because of its liquidity at higher temperatures. I love this coconut oil! It stores very well at room temperature (Soft, but still holds it's shape) and it adds great consistency to my vegan dishes. This is a great value for the amount of coconut oil you receive! We use coconut oil in our tumeric lattés, which we sell a lot of, so this bulk size works great for us.